This is a flag that is used during the Promotion Process so that students can be moved to another class and stay in a pending state until just before Promotion Sunday. 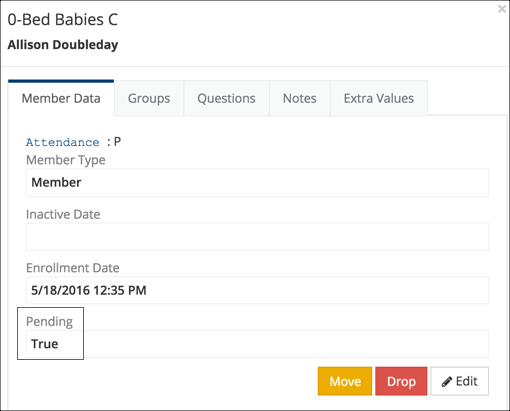 When a student is Pending, their name will display on the Pending tab of the organization, and the Pending flag will be set to True in their Member Dialog. A Pending Member will not display on a roll-sheet and will not display for Check-In. Other use: If you want committee members to be in a ‘pending’ state until a specific date you can add them to the Pending tab of the organization. This will give them a normal Member Type of Member, but will set the Pending flag to True. When it is time for them to become active members, just remove the Pending flag. For Promotion, all of this happens using the steps outlined in the Promotion Process help articles. You can manually add people as Pending Members, and you can manually move them from Pending to Members. This is what you would do for Committees, as an example. Create a Tag and add to it those you want to add to the organization as Pending. Select the Tag from the dropdown and click the blue Select Tag button. Then click the blue Add People button. Stay on the dialog box until you see the message that the process is complete. Everyone in your Tag will now be added as Members on the Pending tab of the org. Go to the organization > Pending tag. Select those you want to move to the Members tab by clicking the box beside their names, and then click Filter . Select Pending > Update Pending , select a Member Type from the dropdown, and then remove the check mark beside the Pending box. Then click the blue Update button. This will move the selected people from the Pending tab to the Members tab. You can add one person at a time by selecting Add Pending Members on the Pending tab. You can make that one person a regular member by clicking on their Member Type, clicking Edit , removing the check mark beside Pending, and then clicking the blue Save button.